The Undo command (Edit -> Undo or shortcut-key: CTRL+Z) is a very useful feature which allows you to undo a number of recent actions starting with the most recent action. If, for some reason, you don't like the result of an undoing an action (for example, when you use the undo command by mistake) you can redo it using the Redo command (Edit -> Redo or shortcut-key: CTRL + shift + Z). 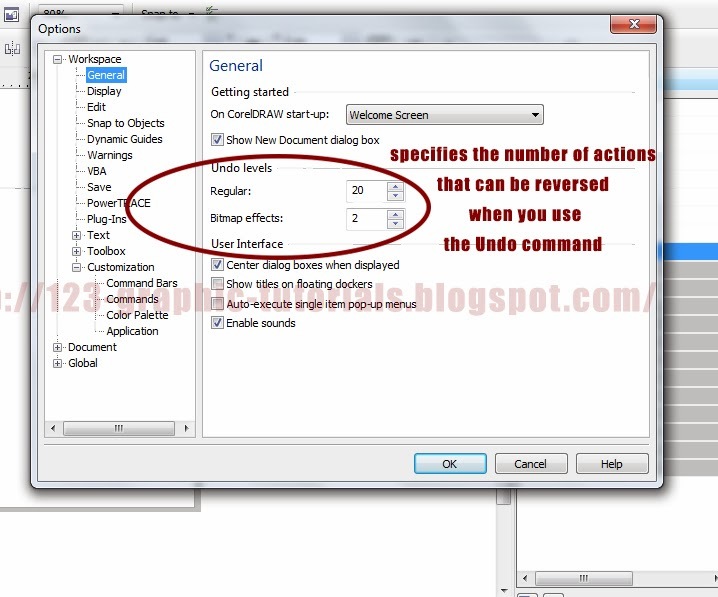 The Redo command is inactive until you use at least once the Undo command. If you undo one or more actions and then you modify your drawing in any way except by using the Undo / Redo commands, the Redo command will become inactive and it will no longer be possible to redo those actions. Sometimes you might need to repeat the last action applied to an object. You can do this very easily by using the Repeat command (click Edit -> Repeat or use the shortcut-key: CTRL + R). By default, CorelDRaw remembers only twenty previous actions which can be undone when one works with vector objects and only two actions which can be undone for the bitmap effects. If you want it, you can increase or decrease the number of actions that you can undo (and redo) by customizing the Undo settings (Tools -> Options -> Workspace -> General -> Undo Levels). The more you increase the number of undo levels, the more random access memory (RAM) is required to store the undo history, so don't increase the number of undo levels beyond a reasonable limit. If you don't want to use the stortcut-keys you can use the Undo / Redo buttons from the Standard toolbar. Next to each one of these buttons there is a little arrow-shaped button. By clicking one of these two buttons and choosing an action from the list you can undo or redo a series of actions. If you are not happy with the result of your work and you don't want to waste your time with the Undo / Redo commands (or if some steps cannot be undone anymore) you can revert to the last saved version of your drawing. Click File -> Revert and the last saved version of your work will be restored (if you haven't saved your document yet the Revert command can't be used.